I recently returned from a trip to Florida which allowed me to sneak in a few book-reading hours I've desperately been missing! I caught up with some of Christy Barritt's novels and am reviewing Dubiosity today. Here's a short blurb, and we'll chat on the other side! Savannah Harris vowed to leave behind her old life as an intrepid investigative reporter. But when a friend raises suspicions about two migrant workers who’ve gone missing from the sleepy coastal town Savannah calls home, her curiosity spikes. As ever more eerie incidents begin afflicting the area, each works to draw Savannah out of her seclusion and raise the stakes—for both Savannah and the surrounding community. Even as Savannah’s new boarder, Clive Miller, makes her feel things she thought long forgotten, she suspects he’s hiding something too, and he’s not the only one. Doubts collide in Savannah’s mind: Who can she really trust? As secrets emerge and danger closes in, Savannah must choose between faith and uncertainty. One wrong decision might spell the end…not just for her, but for everyone around her. Will she unravel the mystery in time, or will doubt get the best of her? I was looking for a contemporary romantic suspense to read, and between the cover and blurb, this book pulled me in. 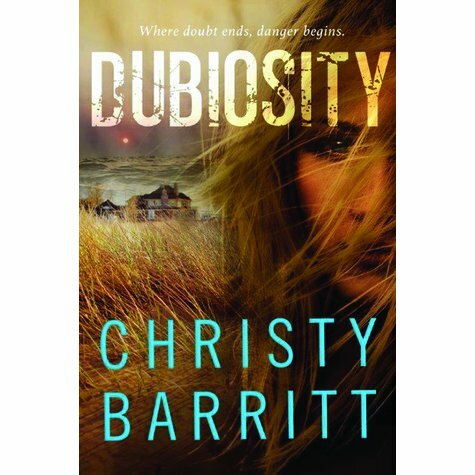 Plus, I've read a few of Christy Barritt's novels and find them typically solid reads with good wit--a mix I enjoy. This story didn't disappoint. I liked getting to know Savannah who was a rich character with a painful past. Barritt always seems to marry her character development and suspense angles well, giving just enough on each page to keep you turning. Dubiosity opens at a strong pace that is kept up throughout. I enjoyed the few twists, though many were ones suspense readers may figure out early. However, they still made sense for all characters and kept the book interesting. The relationship between Clive and Savannah grows at a believable pace with enough tender moments and chemistry to bring in the romance thread to this book. Barritt has a knack for writing strong, imperfect, and believable men who are perfect pairs to her heroines, which only brings further enjoyment to her books. If you enjoy contemporary romantic suspense, I'd recommend Dubiosity, and I happily give it 4 out of 5 stars. Happy weekend, friends! Thanks for the recommendation, Susan. The cover is beautiful, and it sounds like just the kind of book I'd enjoy reading.